Last February, a new residency program made its debut thanks to the support of the Brubeck Circle members and one dynamic board member, Laurie Bentson Kauth. Brandon Mowery, Lobero Theatre Director of Development, spent an afternoon with Laurie to learn more about this dynamic residency, and what fuels her philanthropic involvement with the Lobero Theatre. BM: How were you introduced to the Lobero board, and what is that experience like for you? LBK: Heritage Director Jim Dougherty called me up one day, out of the blue. Jim’s one of the most charming people I’ve ever met in my life! I’m really impressed with how much love there is and how excited and invested all of the Board members at the Lobero are. BM: How did you meet Derek Douget? LBK: My daughter went to law school in New Orleans and [in a nutshell] that’s how I met Derek, who is a jazz musician. It started as a running joke that whenever I would see Derek around Mardi Gras that I would tell him he had to perform at the Lobero. BM: At what point did the educational component for the residency start shining through? LBK: Established musicians in New Orleans are very cognizant of the new generation of kids in the arts. People like Derek look to foster these kids. I have to thank Administrative Director Marianne Clark at the Lobero and Kai Tepper at the Santa Barbara Bowl for their brainstorming and helping this to work. BM: What were the biggest takeaways from the 2018 residency? LBK: It was beyond my wildest dreams! The band embraced their role and made it very special. One moment that stood out is when they met a group of teens called the Jazz Villains, through Notes for Notes. The minute Derek’s band started playing in their tiny little recording studio, their faces were priceless. BM: What are your hopes moving forward with this residency? LBK: I think we can get in front of more kids this year. It’s still amazing to me how it all came together! 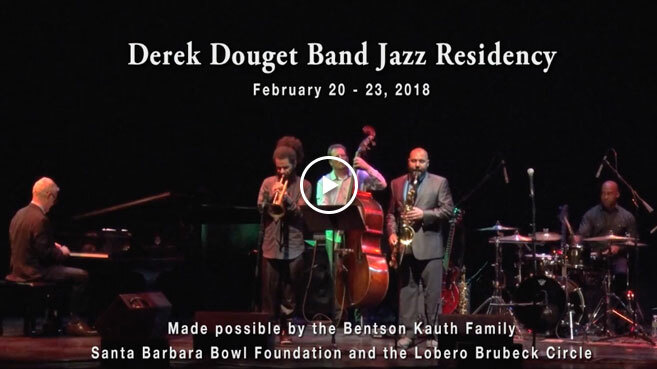 The Brubeck Circle Jazz Residency returns to Santa Barbara March 11-15, culminating with a performance by the Derek Douget Band that you won’t want to miss! The Brubeck Circle of donors has made it possible for the Lobero to bring amazing jazz, blues and roots artists like Herbie Hancock, Wayne Shorter, Dr. John, Chris Thile, Robert Cray, and Keb’ Mo’ to the stage. Jazz at the Lobero subscribers and this dedicated group of individuals anchor our various American Roots series, which are vital to to our programming. But the Brubeck Circle does more than just bring great performers to Santa Barbara. Funds are used to ensure that local students receive music education and carry the legacy of uniquely American music into the next generation. Santa Barbara Vocal Jazz Foundation residencies at local elementary schools, teaching jazz history, appreciation and performance to hundreds of children each year. Jazz and rock performances by local students on the Lobero stage, giving participants a professional performance experience with a skilled stage crew and state-of-the-art equipment. Residencies and master classes with touring artists like Tierney Sutton, Terence Blanchard, and the Brubeck Fellows from University of the Pacific. Free or discounted tickets to students and families for jazz and family-friendly performances at the Lobero. Participation in these programs gives students necessary tools for future success in all aspects of life: creativity and problem solving, confidence, greater focus and dedication, and the ability to collaborate with and learn from their peers. It also inspires children to continue pursuing the arts throughout their education, and in some cases throughout their careers. Click here to read more about this program, and we hope you’ll want to get involved. You can designate a gift to the Brubeck Circle here.